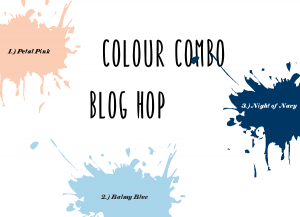 Welcome to the Colour Combo monthly blog hop where you are given 3 colours to use for your project. This month we have been given the colours Petal Pink, Balmy Blue and Night of Navy. Petal Pink and Balmy Blue are 2 of our new colours following our recent colour revamp. This month I decided to use the Beautiful Bouquet stamp set and the Bouquet Bunch Framelits dies as I ordered them a while ago but have not yet to use them. I chose to have a Night of Navy card stock mat layer, then a Balmy Blue card stock mat layer. The next layer is Whisper White card stock which has been embossed using the Tufted Dynamic textured impressions embossing folder. 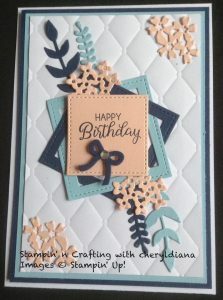 For the sentiment I used the ‘Happy Birthday’ from the Beautiful Bouquet stamp set. This was stamped using Night of Navy Ink onto Petal Pink card stock. This was then die cut using the Square Stitched Shapes Framelits. Frames were also cut out frames using Balmy Blue and Night of Navy card stock and the Square Stitched Shapes Framelits . Finally I die cut some bunches of flowers, leaves and a bow using scraps and added a rhinestone to the bow to finish it off. I hope you have enjoyed looking at my project. Please do leave comments before you click on the next button to visit Anastasia and she what she has made using the 3 colours given to us. Posted in Cards, Stampin' Up!. Hello Cheryl! I love your card because you used my actual favorite embossing folder. Light and shadow of your project come out really great! STUNNING Card Cheryl, Love it!! !